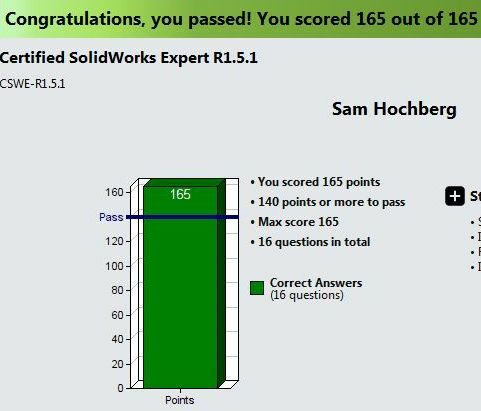 …Certified SolidWorks Expert. That and all 6 of its prerequisites – totaling almost 14 hours of tests. Those included the CSWP test – “Certified SolidWorks Professional” – and 5 CSWPA tests – “Certified SolidWorks Professional Advanced” – on topics including Advanced Surfacing, Mold Design, Weldments, Drawings, and Sheet Metal. This brings me to 15 CAD Industry Certifications. WOW! Way to go Sam! oh my good! you are excellent, can you support for me about cswe examination?